The e-commerce giant says it will place solar power-generating systems in 15 fulfillment and sortation centers in the U.S. this year. By 2020, 50 Amazon facilities around the globe will be drawing some energy from the sun. Amazon.com is putting the idle rooftops of a significant portion of its massive warehouses to work — by installing solar panels. The e-commerce giant says it will place solar power- generating systems in 15 fulfillment and sortation centers in the U.S. this year. By 2020, 50 Amazon facilities around the globe will be drawing some energy from the sun. That amounts to a meaningful percentage of Amazon operations: In the U.S., the company has about 95 warehouses and distribution centers and 29 regional sortation centers, while it has 149 facilities outside the U.S., according to MWPVL International, a logistics consultancy that closely tracks the size of Amazon’s empire. The energy impact could also be big: Amazon estimates that up to 80 percent of the power needed by a single location could be generated by the solar panels. The move comes amid a race among corporate behemoths, from Google to Wal-Mart, to embrace green power. It’s an important theme for Amazon, a company that’s globally known for its fast growth and which has been criticized by activists for keeping information about its energy footprint close to its vest. Amazon boasts that it was the largest corporate purchaser of renewable energy in 2016, thanks in part to efforts to power the gargantuan data centers that its cloud business lives on with energy generated by the sun and wind. The latest move may immediately push Amazon into the ranks of the top 10 corporate users of solar power, a list dominated by retailers that have harnessed the ample square footage of their real estate as a platform for solar-energy systems. Amazon estimates that by the end of the year its first batch of projects — in California, Maryland, Nevada, Delaware and New Jersey — will generate up to 41 megawatts (MW) of electricity. Some Amazon fulfillment centers already have solar panels on their roofs. 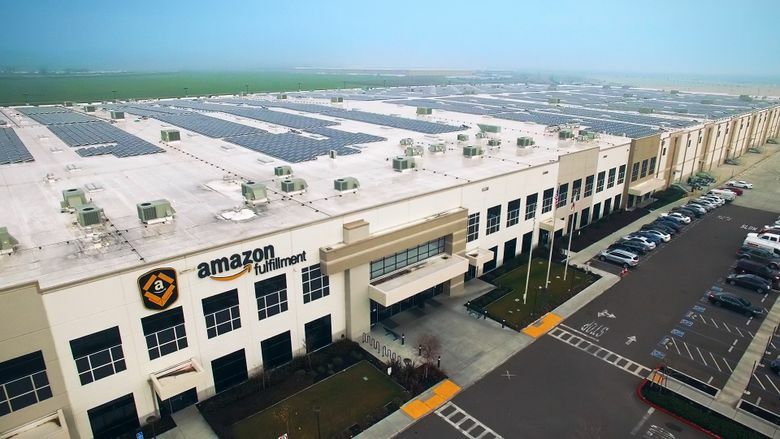 According to a report published last October by the Solar Energy Industries Association, the largest corporate user of solar power was Amazon rival Target, with 147.5 MW of installed capacity in 300 locations. Archrival Wal-Mart came second, with 145 MW. Amazon’s projected capacity would come in between Ikea’s and Macy’s, No. 7 and 8, respectively. “It’s fair to say we’re taking a very aggressive approach to the amount of square footage in the U.S.,” Dave Clark, Amazon’s senior vice president of worldwide operations, said in an interview. Amazon wouldn’t disclose how much it’s spending on the solar installations. But the move underscores the maturity of solar technology. Steep drops in the cost and deeper expertise in usage and installation have helped the technology spread. “Certainly the cost of the technology and the increase in availability has been a contributor” to Amazon’s ability to undertake the project, Kara Hurst, Amazon’s director of sustainability, said in an interview. In addition to putting panels on its rooftops, Amazon says it will help train the workforce tasked with installing them. It will expand its Career Choice program to pay for warehouse employees to get certified as photovoltaic installers, a rapidly growing industry. “Our folks will also be at the forefront of what we think is going to be an increasingly broad penetration of solar in coming years,” Clark said.